The helmet's shell is custom designed with Wild metalflake and pistons logo aerodynamically designed, helping to reduce wind noise and neck fatigue on long rides. 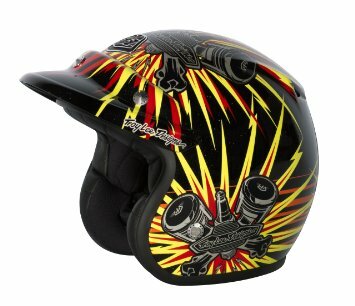 A vintage style snap on color co ordinated removable Peak comes with the helmet. The Troy Lee Designs logo is metal and die cast while other metal accents on the helmet are machined. A matching helmet bag is included for protection of the helmet when not in use.